Penelope Featherington has secretly adored her best friend’s brother for…well, it feels like forever. After half a lifetime of watching Colin Bridgerton from afar, she thinks she knows everything about him, until she stumbles across his deepest secret…and fears she doesn’t know him at all. Colin Bridgerton is tired of being thought nothing but an empty-headed charmer, tired of everyone’s preoccupation with the notorious gossip columnist Lady Whistledown, who can’t seem to publish an edition without mentioning him in the first paragraph. But when Colin returns to London from a trip aboard he discovers nothing in his life is quite the same — especially Penelope Featherington! The girl haunting his dreams. But when he discovers that Penelope has secrets of her own, this elusive bachelor must decide…is she his biggest threat — or his promise of a happy ending? My review: Scandal! Scandal abounds in this one and its oh so juicy! Throughout the Bridgerton series there has been a gossip column – Lady Whistledown’s Society Papers – that is delivered with a scathing wit and dry humor much to the consternation of the London ton, there has been much speculation as to the identity of Lady Whistledown – myself included – and I for one thought it was Lady Danbury or Eloise Bridgerton but I was pleasantly surprised to find that it was neither of those ladies. The identity of Lady Whistledown is revealed in Romancing Mr Bridgerton but I won’t spoil it for y’all! 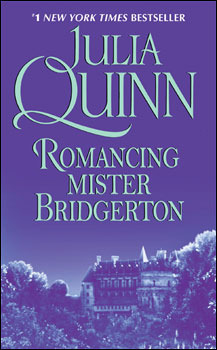 Romancing Mr Bridgerton follows the tale and eventual love of Penelope Featherington (an on the shelf spinster) and Colin Bridgerton (Number Three). Luckily you don’t have to read the books in order as there is a brief background given on each character and their relationship to the main characters as you read about them which is another thing I like about this series. Colin Bridgerton is the third of eight Bridgerton children and the ‘class clown’ of the family – he oozes charm and is able to make light of any situation. Throughout the ten years these books are spread over the relationship dynamic between Colin and Penelope has grown but only in a minuscule way, in this book their relationship grows exponentially and develops into a love match. Statistically – according to research – marriages in Regency London didn’t always end in a love match and were strictly about gaining titles and land; I find that a love match is always sweeter when it comes from a marriage of convenience. Penelope and Colin have been friends for a decade and they both expected friendship to be all they would ever had but Julia Quinn surprised me by having Penelope’s unrequited feelings for Colin returned at last! In the previous book there was an accidental comment regarding marriage and Penelope from Colin and I thought that that was it and that there would be nothing further for either of them. Julia Quinn has retained the same writing style as in the previous three books which makes this one flow just as easily – it took me about 6 hours to read this book because it was such an easy read. The main characters were well written and their budding relationship is just the right balance between fright and shocked wonder; the secondary characters had the same mannerisms as in the previous books and nothing jumped out at me as off putting. I found the book to be just the right length also – occasionally a book can drone on and on for a few hundred pages without actually telling you anything new or exciting but Romancing Mr Bridgerton did not have that issue. Very few editing errors and there wasn’t an overabundance of unnecessary description.